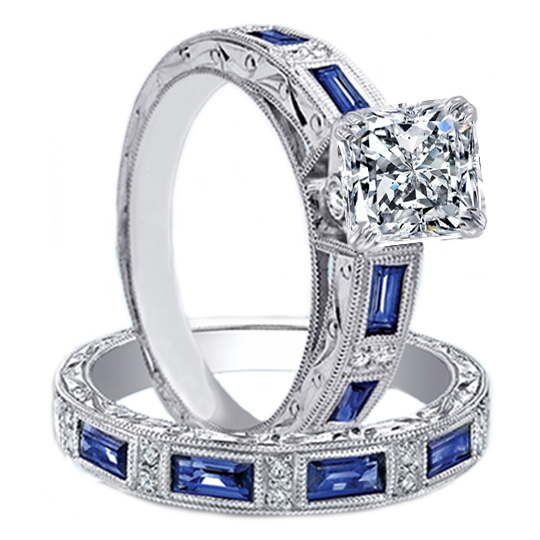 This Princess Diamond Vintage bridal set features on the engagement ring four bezel set straight baguette blue sapphires gem stones (approx. 0.40 tcw) and eight round brilliant cut diamonds (0.08 tcw) on the band as well as two other bezel set diamonds (0.04 tcw) in the gallery. 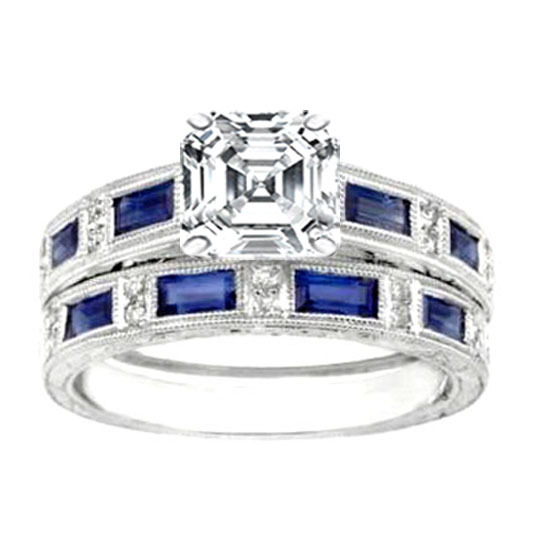 The matching wedding band features four bezel set straight baguette blue sapphires (approx. 0.40 tcw) and ten round brilliant cut diamonds 0.10 tcw). Both in a 14 karat white gold band with milligrain edges. Also available in platinum, yellow and rose/pink gold. 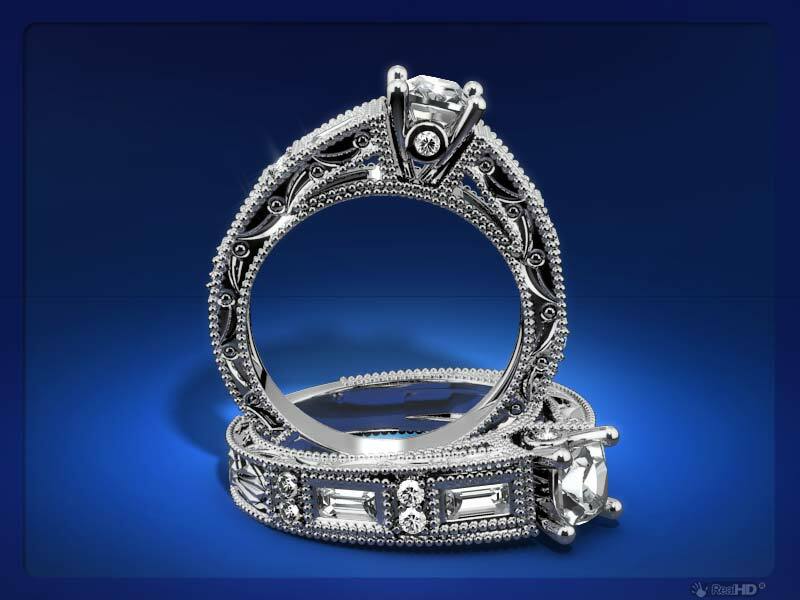 This setting is custom made for the center diamond of your choice. Sold only as a bridal set. 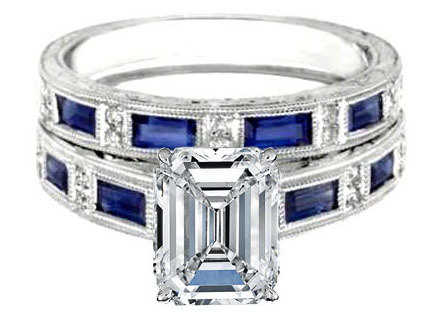 This Vintage Asscher diamond bridal set features on the engagement ring four bezel set straight baguette blue sapphires gem stones (approx. 0.40 tcw) and eight round brilliant cut diamonds (0.08 tcw) on the band as well as two other bezel set diamonds (0.04 tcw) on the bottom of the main diamond. 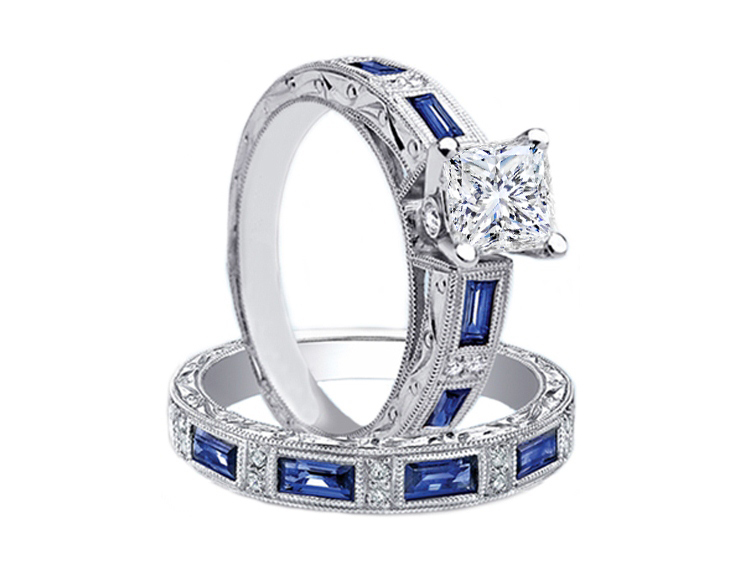 The matching wedding band features four bezel set straight baguette blue sapphires (approx. 0.40 tcw) and ten round brilliant cut diamonds 0.10 tcw). Both in a 14 karat white gold band with milligrain edges. Also available in platinum, yellow and rose/pink gold. This setting is custom made for the center diamond of your choice. Sold only as a bridal set, and not available separately. 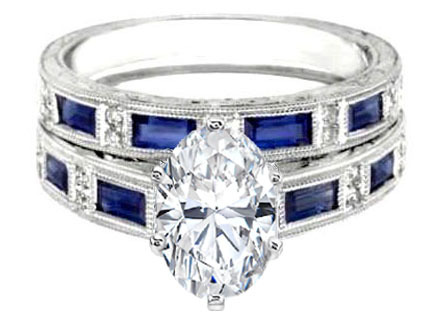 This Vintage bridal set features on the engagement ring four bezel set straight baguette blue sapphires gem stones (approx. 0.40 tcw) and eight round brilliant cut diamonds (0.08 tcw) on the band as well as two other bezel set diamonds (0.04 tcw) on the bottom of the main diamond. 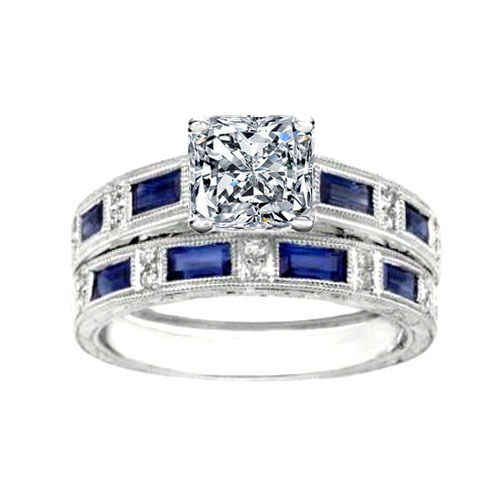 The matching wedding band features four bezel set straight baguette blue sapphires (approx. 0.40 tcw) and ten round brilliant cut diamonds 0.10 tcw). 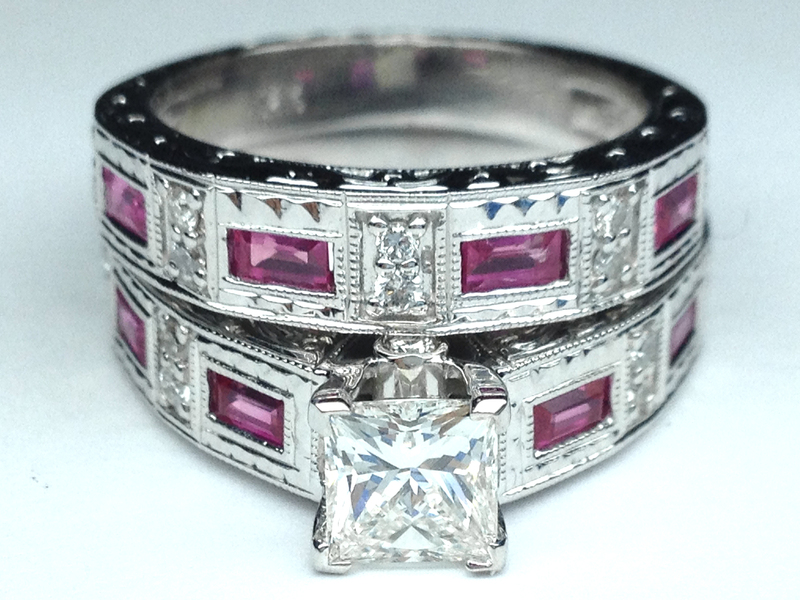 Both in a 14 karat white gold band with milligrain edges. Also available in platinum, yellow and rose/pink gold. This setting is custom made for the center diamond of your choice. Sold only as a bridal set, and not available separately. 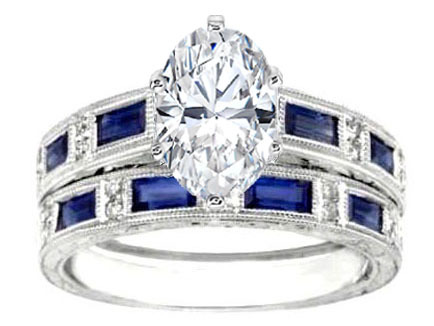 This vintage engagement ring setting features four bezel set straight baguette blue sapphires gem stones and eight pave set round cut diamonds on the band as well as two other bezel set diamonds on the bottom of the main center stone. 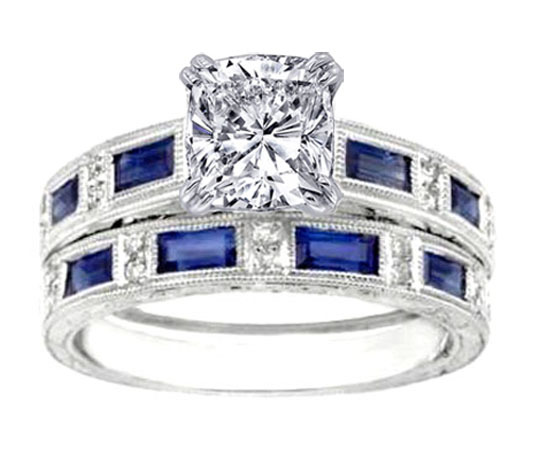 Each matching wedding bands feature four bezel set straight baguette blue sapphires and ten round cut diamonds to complete this wide beautiful set with milligrain edges. 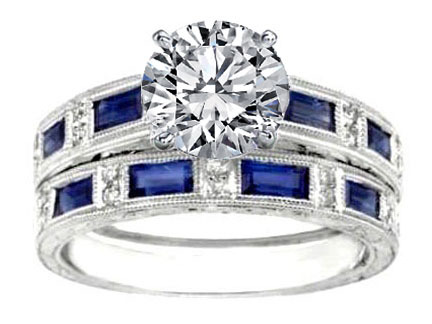 This setting is custom made for the center diamond of your choice. Sold only as a bridal set, NOT available separately. This Vintage Round Diamond engagement ring four bezel set straight baguette diamond (approx. 0.30 tcw) and eight round brilliant cut diamonds (0.08 tcw) on the band as well as two other bezel set diamonds (0.04 tcw) on the bottom of the main diamond. 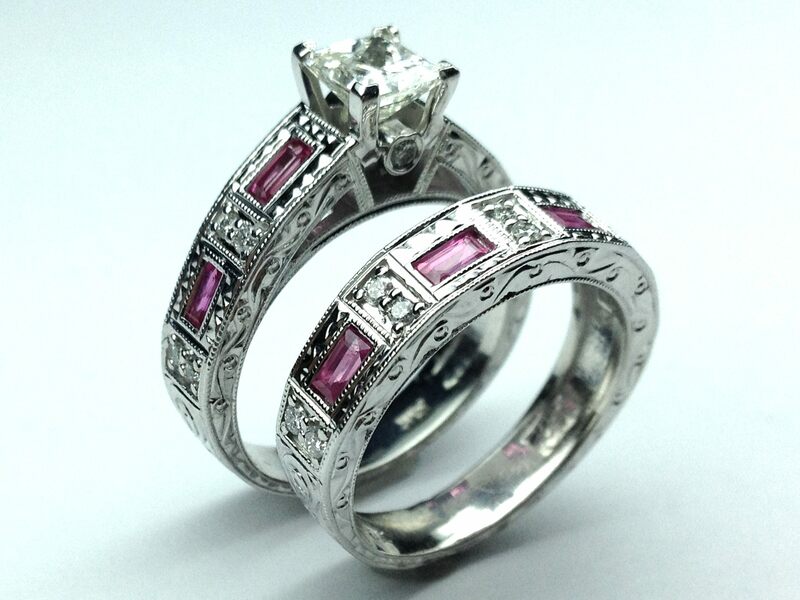 set in a 14 karat white gold band with milligrain edges. Also available in platinum, yellow and rose gold. This setting is custom made for the center diamond of your choice. This Vintage Emerald Cut Diamond bridal set features on the engagement ring four bezel set straight baguette blue sapphires gem stones (approx. 0.40 tcw) and eight round brilliant cut diamonds (0.08 tcw) on the band as well as two other bezel set diamonds (0.04 tcw) on the bottom of the main diamond. 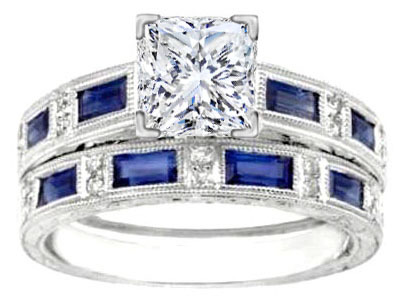 The matching wedding band features four bezel set straight baguette blue sapphires (approx. 0.40 tcw) and ten round brilliant cut diamonds 0.10 tcw). Both in a 14 karat white gold band with milligrain edges. Also available in platinum, yellow and rose/pink gold. This setting is custom made for the center diamond of your choice. Sold only as a bridal set, and not available separately. This Vintage Oval Cut Diamond bridal set features on the engagement ring four bezel set straight baguette blue sapphires gem stones (approx. 0.40 tcw) and eight round brilliant cut diamonds (0.08 tcw) on the band as well as two other bezel set diamonds (0.04 tcw) on the bottom of the main diamond. 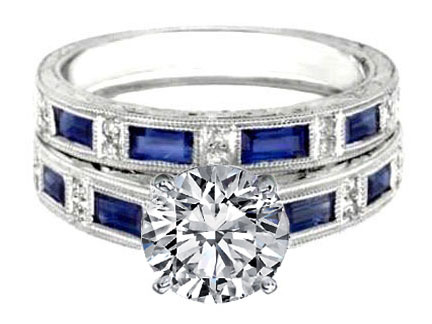 The matching wedding band features four bezel set straight baguette blue sapphires (approx. 0.40 tcw) and ten round brilliant cut diamonds 0.10 tcw). Both in a 14 karat white gold band with milligrain edges. Also available in platinum, yellow and rose/pink gold. This setting is custom made for the center diamond of your choice. Sold only as a bridal set, and not available separately. This Princess Diamond Vintage bridal set features on the engagement ring four bezel set straight baguette Pink sapphires gem stones (approx. 0.40 tcw) and eight round brilliant cut diamonds (0.08 tcw) on the band as well as two other bezel set diamonds (0.04 tcw) in the gallery. 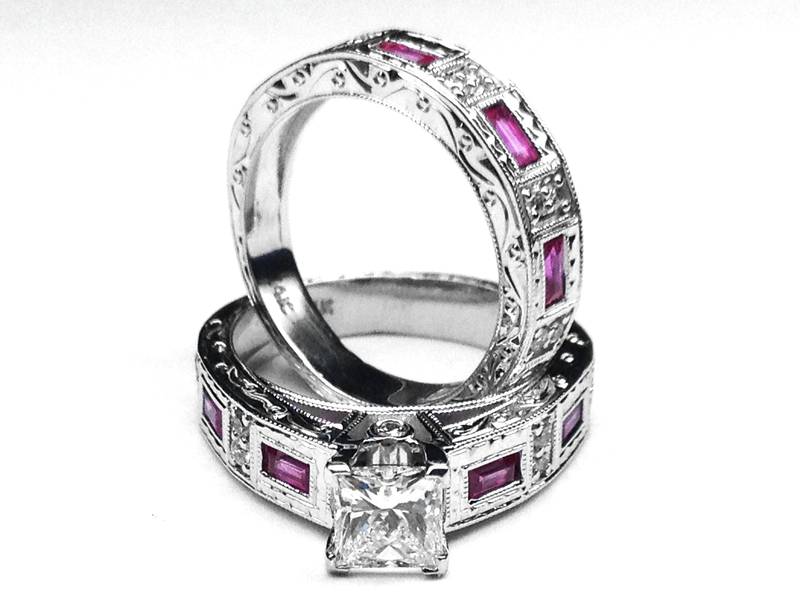 The matching wedding band features four bezel set straight baguette pink sapphires (approx. 0.40 tcw) and ten round brilliant cut diamonds 0.10 tcw). 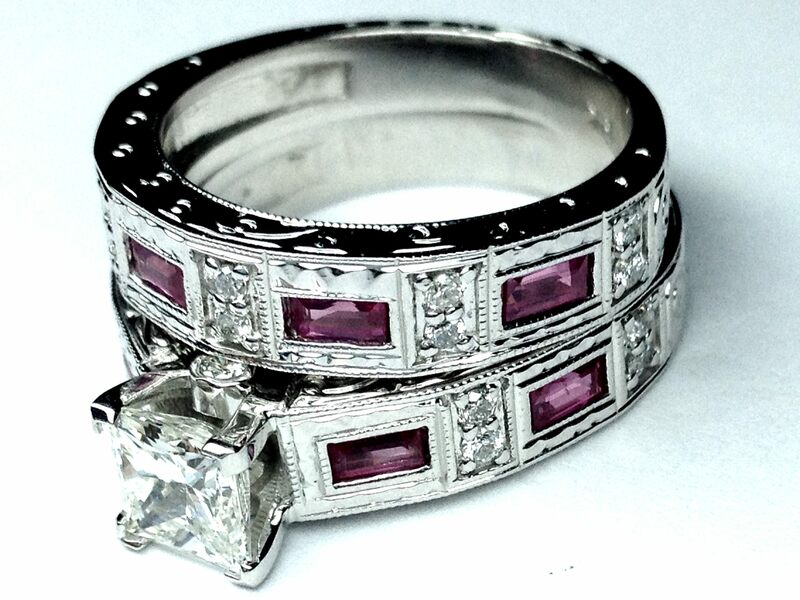 Both in a 14 karat white gold band with milligrain edges. Also available in platinum, yellow and rose/pink gold. This setting is custom made for the center diamond of your choice. Sold only as a bridal set. This Vintage Radiant Diamond bridal set features on the engagement ring four bezel set straight baguette blue sapphires gem stones (approx. 0.40 tcw) and eight round brilliant cut diamonds (0.08 tcw) on the band as well as two other bezel set diamonds (0.04 tcw) on the bottom of the main diamond. 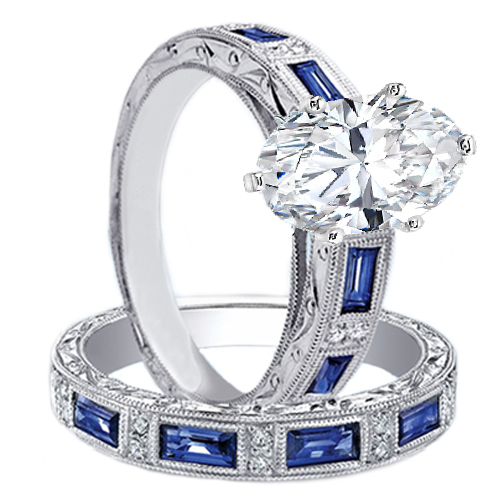 The matching wedding band features four bezel set straight baguette blue sapphires (approx. 0.40 tcw) and ten round brilliant cut diamonds 0.10 tcw). Both in a 14 karat white gold band with milligrain edges. Also available in platinum, yellow and rose/pink gold. This setting is custom made for the center diamond of your choice. Sold only as a bridal set, and not available separately. The ring is perfect! Even better than I expected!I haven’t proposed yet (that is still in the works). I’m 100% sure she’ll love it though when I do give it to her.